Velma Kate Branch Spell, 91, of 3425 Roseboro Hwy, passed away Wednesday, January 30, 2019 at Southwood Nursing Center. The family will receive friends from 1 PM – 2 PM, Friday, February 1, 2019 at Crumpler-Honeycutt Funeral Home. A funeral service will follow at 2 PM, Friday, February 1, 2019 at the funeral home, with Pastor James Earl Hughes, Sr., officiating. Velma, born in Sampson County in 1927, was the daughter of the late Freddie Bristow Branch and Katie Elizabeth Carter Branch. 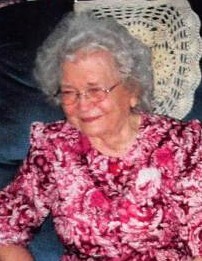 She was a secretary at Spell’s Auto Sales, served as church clerk, Women’s Mission Leader and worked at Hamilton Beach. In addition to her parents she was preceded in death by her sisters and several brothers. Survivors include: husband of seventy years, A. E. Spell; children, Edwin Ray Spell and wife Patsy of Wallace and Jackie Murray and husband Charles of Clinton; grandchildren, Darrell Spell (Meredith), Kim Spell Jones (Ray), and Heather Murray Watson (Derek); great-grandchildren, Dustin Wadsworth, Brittney Jones, Carson Jones, Bryson Spell, Katelyn Spell, Cohen Spell, Gabby Watson and Gloria Watson; and brother, Junior Street (Doris). Memorials may be made to The Church of God, c/o Jackie Murray, Clerk, 3411 Roseboro Hwy, Clinton, NC 28328.